It’s hot. I don’t feel like cooking outside much. And I have lots of wild game in the freezer still. What to do? BBQ! I’ve been doing a lot of grilling and barbecue over at Simply Recipes with Elise, and nearly everything I do there with domestic meats translates well with wild game. Elise and I played around with a beer can chicken recipe, and it was so good I knew I had to try to make beer can pheasant, using my last remaining whole pheasant. If you’ve never eaten beer can chicken before, you are missing out. It may be the second greatest thing the NASCAR crowd has brought to American cooking, behind true barbecue itself. Done right, you get a crispy skin, meltingly tender breast meat, and the legs and thigh meat practically falls off the bone. It’s the perfect chicken. But would it work for pheasant? First problem: Pheasants have slim hips. Too slim to jam a regular beer can up inside them. Hmmm… what sort of can might fit in a pheasant? I got it! Red Bull. Now I detest this stuff — tastes like sweet tarts — so I poured it all out and washed the can well to get rid of the Red Bull taste, then I filled the can up halfway with beer. Turns out a pheasant cooked this way needs only about 45 minutes. I overcooked mine by thinking it would need an hour. But, the skin was crackling crispy, and the legs looked fine. I let the pheasant rest for 10 minutes before cutting into it. Could this work for other game birds? Maybe. The key is the can. 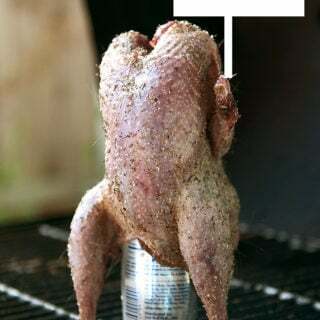 I’d try a Foster’s Lager “oil can” for a wild turkey, and I bet the Red Bull can would work on a large grouse. Not sure who makes cans small enough for partridges or quail, however. Beer can chicken is one of the best ways I know to roast a chicken, especially in summertime, when you can do this recipe on the grill. But, while you can jam a regular beer can into a pheasant, the birds are generally too small. But a Red Bull can will fit. Fill it halfway with beer. Take the pheasants out and let it rest at room temperature for about 30 minutes. Bring the beer out, too, as you don’t want cold beer in the can. Rub the pheasants all over with olive oil. Mix the salt, pepper, and thyme in a bowl and sprinkle it over the pheasant. Fill the Red Bull can halfway with beer; it doesn’t matter what kind. Drink the rest of the beer. 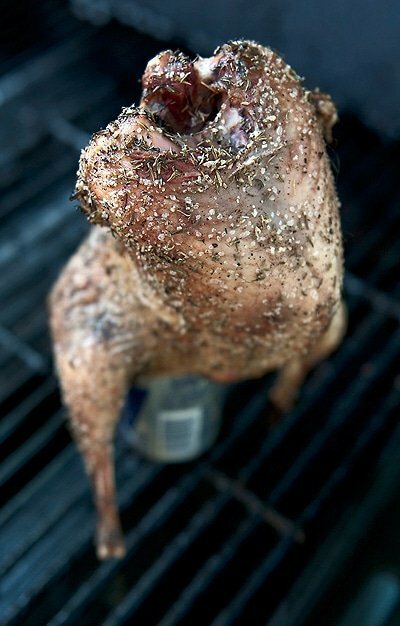 Put the can inside the pheasants' cavity and place the pheasants on the cool side of the grill. The legs and the can will act like a tripod to keep the pheasant upright. Cover the grill and come back in 40 minutes. After that time, check the pheasants and add more coals if needed. Stick a thermometer into the thickest part of the pheasant’s thigh — you want it to read 160 degrees. If it’s not there, close the grill lid and come back in 15 minutes. Keep checking this way until the pheasant is done. If you don’t have a meat thermometer, poke the spot between the leg and breast with a knife and look for the juices to run clear, not pink. Carefully move the pheasants to a pan. Let them rest for 10 minutes. Carefully lift it off the can and carve up into serving pieces. Consider brining your pheasants first, especially if it was a wild bird. Mix 1/4 cup of kosher salt with 4 cups of water and add some seasonings: I like bay leaves, rosemary and cracked black pepper. Submerge the pheasant in this brine for 4 to 8 hours, then drain and let sit in the fridge uncovered the next day — this helps you get a crispy skin. 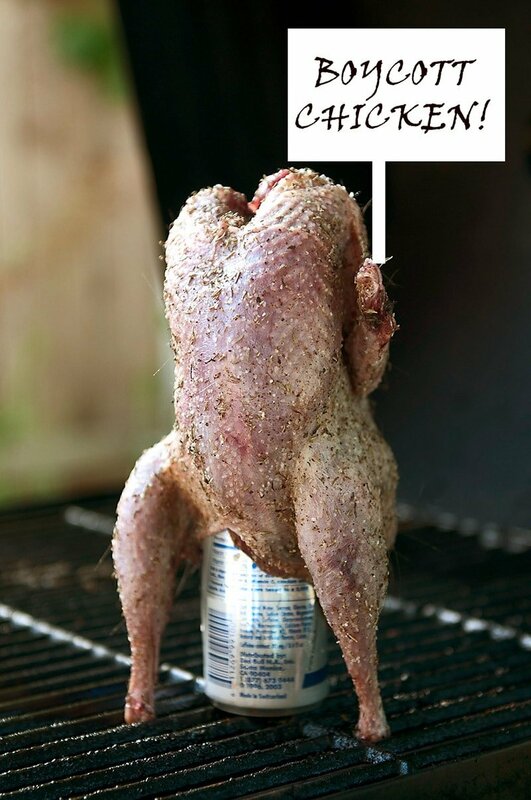 After that, you can do this like a regular beer can chicken. I haven’t yet had the luck to make this recipe with pheasant but for a beer can chicken it blows my mind every time. I love this recipe. It defines great cooking to me, simple ingredients prepared in such a way that results in near perfection. Crispy skin, full of flavor, perfectly moist meat. One thing I have noticed with Hank’s cooking is that a lot of it takes time. Not to much time to prepare but, waiting on a brine, or marinade. This recipe is no different, follow his instructions and give the bird the time to brine and rest in the fridge and you will be rewarded. The recipe is made with simple ingredients but, the method of prep and especially the time to dry in the fridge makes the most delicious crispy skin on the bird. 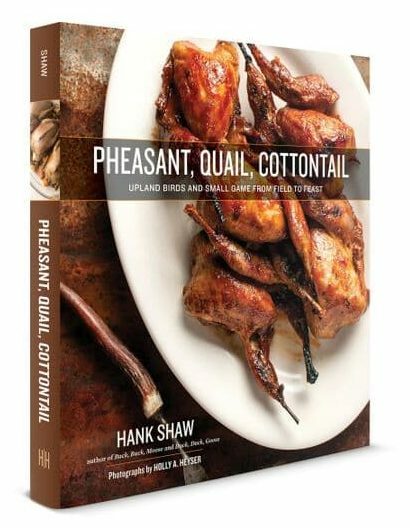 Hank’s recipes take time because wild game deserves special care. Even if you decide to use chicken this recipe deserves the best bird you can find. I have made it with a cheaper bird and the taste was noticeable.